Hardy to about -8C, happily withstanding all but the severest of winters. Supplied as a standard lollipop form tree approx. 80-90cm tall in a 3L pot. 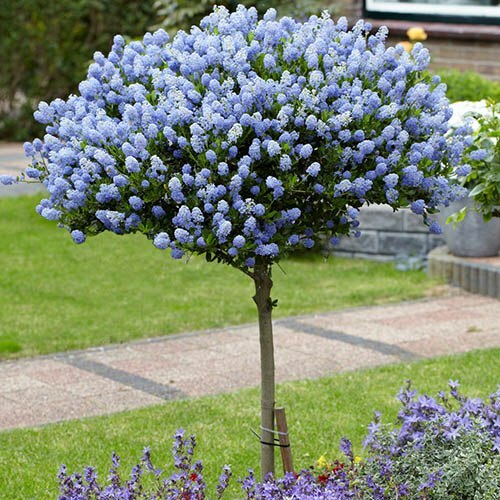 This stunning Ceanothus Repens, also called 'Californian Lilac', has been skilfully grown to form a tall standard tree for instant impact. In spring, they produce clouds of lovely sky-blue flowers in clusters for several weeks. After flowering, their deep green evergreen foliage will provide year-round interest too, and is easily clipped to shape once a year. Hardy to about -8C they will be happy left outdoors in all but the severest of winters, continuing to perform in your garden year after year. Great as a pair in large pots framing doorways, gateways or around patios. Remove faded blooms to keep your standard tree tidy. Cut back new growth to healthy leaf sets while it is actively growing to control the shrub's size. Do not cut branches that are more than 1 inch in diameter. To keep your standard tree looking at its best, remove any side shoots (laterals) from the trunk of the young tree in the winter. Any weak or competing shoots can also be removed from the top of the tree if needed. By keeping your standard tree in its pot, you can limit its size and keep it manageable. Spring is the best time to repot potted standards. Repot your standard tree every other year. Use the same pot if you want to keep it at its current size, or up to 5cm (2in) bigger is you would like to grow it on a bit more. Remove the plant from its pot and trim off any rotten roots or roots that are winding around the outside of the root ball. Cut away the bottom one-third of the root ball using a pruning saw and replant using fresh potting soil or compost.